The bottom line is that if the Assad regime of Syria survives on the strength of chemical weapons of mass destruction, an incredibly dangerous to American national security situation will come to pass. The Chemical Weapons Convention will be dead, publicly murdered and discredited similar to the way the Kellogg-Briant Pact against war was in the face of Nazi rearmament. There will be an arms race for chemical weapons of mass destruction in the Mid-East & elsewhere. That will require the US military to rearm with either lethal chemicals or with tactical nukes — with all the costs that requires both financial and moral — in order to maintain a credible deterrent for future conventional military operations. The issue with the Assad Regime’s use of chemical weapons of mass destruction is the Assad regime . The only fit punishment, one that will prevent catalytic proliferation of chemical and other weapons of mass destruction around the world, is the Assad Regime’s over throw. That overthrow is readily obtainable by American military forces and can be achieved without a single boot on the ground, nor a single foreign ally. The fact that the Obama Administration is unwilling use grasp those means, and to politically justify their use with the same sort of weapons of mass destruction argument that Pres. George W. Bush deployed to justify regime change in Iraq, is the real strategic “Red Line” for Syria. It is a Red Line that the American people chose in electing a Democratic Senate in 2006 and in both electing and reelecting Pres. Obama (and a Democratic Senate) in 2008 and 2012. It is a “Red Line” that has to be erased by competent and principled Presidential leadership that forthrightly explains the threat, continually over time, if Americans are to continue enjoying — its admittedly rapidly declining — freedom from police state surveillance at home. When you are looking at a military campaign, you need to define who your enemy is, what his weaknesses are, what means you have to address those weaknesses and what the “desired end state” is versus the expected reality of not acting to understand why you are doing it. And most importantly, competent Presidential leadership would then communicate that to the American people. To start with definitions, the Assad Regime is a terrorist supporting, minority population controlling, failed, 3rd world state that has just used a chemical weapon of mass destruction — nerve gas tipped artillery rockets — to murder a Sunni neighborhood of Damascus in order to terrorize a Sunni Muslim majority tribal revolt. The Assad Regime is supported militarily by Iran and politically in the UN Security council by Russia and China for reasons which I will touch on later. The 2.5 year and counting Sunni Tribal Revolt has been infiltrated and taken over by al-Qaeda affiliated terrorist organization for reasons mainly due to the culture of the Syrian people and slightly due to the Obama Administration’s unwillingness to support non-al-Qaeda tribal factions. Whatever footprint we have in Jordan. The Obama Administration decision honor it’s campaign pledge to the American people and withdraw from Iraq was far more important. It removed the CIA’s ability to affect events over wide areas in Syria directly. 1) The predominant foreign petroleum, oil and lubricant (POL) source for the Assad Regime is Iranian foreign aide through Syria’s one sea port. 2) The predominant foreign currency income stream (after air-lifted fake Iranian US $100 bills) for the Assad regime is drugs — opium poppies — out of the Bekaa Valley. 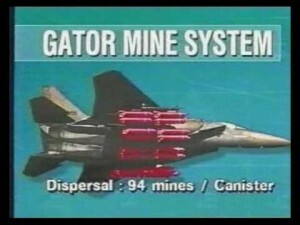 Air-laid Destructor sea mines off Syrian and Lebanese ports plus a no-fly zone — enforced with cruise missile cratered and air-laid Gator scatterable mines on Syrian runways and over watched by drones to tell us when we need to re-strike — will see the Assad Regime lose it’s air power and run out of POL for its combat vehicles. Then, with fuel-less heavy weapons like tanks and aircraft, the Sunnis majority uprising will eat the Alwite minority Assad Regime. Game Over for both Assad Regime and the advantages of WMD proliferation for terrorist supporting regimes. This military course of action also happens to be something Pres. Obama can do without Congress while following the strict letter of the War Powers Act. All Pres. Obama has to do is periodically “withdraw the fleet” and “Stop flying the Heavy Bombers” to restart the 60-day clock. The President has both the constitutional and military power to win in Syria, what he lacks is the will. And the reason he lacks the will is that it would require the Obama Administration to admit Pres. George W. Bush was right on weapons of mass destruction. In the face of an American military blockade, the options of the Assad Regime to break it or endure it are limited. A Russian IL76 airlift of aid into Damascus cannot replace the lost POL. Nor can a truck route from Iran through Iraq/Turkey replace the sea delivered POL, as 300 miles truck travel on bad roads requires more than the truck’s payload in burnt fuel to deliver it. Iran would have to double it’s oil shipments just to stay even, and run it through Sunni Revolt controlled territory. More likely the Russians will fly to Beirut and have whatever trucked from there to and from Syria. Not because they want to, but because they won’t have the fuel at Damascus international airport from the damage we will do to Assad’s POL storage & pumping facilities, plus the irregular mining of Syrian runways there in the event of a serious American no-fly zone. IL76s can deliver a lot, but not if they have to carry the gas to get back to either Beirut or Cyprus from Damascus, and have to operate on a rough strip at Damascus to boot. As for what the Russians will do in the event of American sea mining, please see the precedent Operation Linebacker and the mining of Haiphong Harbor in North Vietnam. Neither Russia or China on Syria’s side, nor America on our own, can move a resolution through the UN Security Council veto that all three nations possess. Russian and Chinese interests are not served by a war with the USA for Syria. What they are trying to create in their support of Syria is a post “PAX AMERICANA” world. A multi-polar world where the Russians and Chinese will have room to maneuver without American predominance. Proliferation of WMD will do that, as the precedent of successful Syrian weapons of mass destruction use means that reasonably responsible and reasonably fearful states like the Turks, Saudis, Egyptians, Jordanians, Taiwanese and Japanese will go there too. Japan going nuclear is not something I want to see in my lifetime. And again, it is a measure of relative competence that the Obama Administration hasn’t made this argument. This strategic policy quagmire is the price Pres. Obama is paying as President for the Democratic Party’s Bush Derangement Syndrome politics that got him into office. Pres. Obama and the Democrats would rather a lot of Americans die from weapons of mass destruction than admit that Bush was right. And all elected Republicans in D.C. would rather hold on to their scraps of power than follow Winston Churchill’s path into the political wilderness for speaking rhetorical truth to the real power — the American people. Acting to depose Assad means we will have an ethnic cleansing, al-Qaeda supporting, economically & politically irrational terrorist state that hates Iran and the Syrian Alwites who staffed Iran’s WMD facilities. This entry was posted on Monday, September 9th, 2013 at 7:27 am	and is filed under International Affairs, Iran, Iraq, Islam, Israel, Middle East, Military Affairs, National Security, Terrorism, Uncategorized, USA, Xenophon Roundtable. You can follow any responses to this entry through the RSS 2.0 feed. Both comments and pings are currently closed. And after the fall of the Assad regime….who or what would be running Syria? Indecision can be a dangerous thing. If 0 had struck (as I think he, at one point, portrayed himself as Constitutionally enabled to do) a quick, hurting (but not decisive WRT the outcome of the Syrian revolt) blow…..problem solved. Does the EU have a dog in this fight? Nato? Why is it that the US has do the heavy lifting for a problem in the EU’s back yard? Obama has done a rather poor job making his case. Syria Accountability and Lebanese Sovereignty Restoration Act of 2003 Sec.4 item 8 provides a framework for action in that it was enshrined in law that Syria’s WMD were a threat to the US. His refusal to use or follow past precedents probably stem from ideological beliefs, but they are also may be due to the fact that Syria’s WMD don’t now represent and never really represented a threat to us. He just doesn’t have a good strategic case (if he cared to consider such things). If Israel and Turkey can manage Al Qaeda terrorists in the region then why can’t they manage chemical weapons? Israel has been de facto policing weapons proliferation in the Levant and Mesopotamia for decades and I see no reason for us to step in. Maybe Al Qaeda hates Iran and could be counterweight to their influence. Maybe they will turn the country into the next Afghanistan. One thing I do know is they definitely hate us and are our sworn enemy. They unleashed the most devastating attack on our country in generations. Aiding them or even influencing events to tip in their favor is unthinkable. I’ll take anybody over them. Trent…why warlordS, plural? Why would not ONE warlord, probably the most violent and radical, succeed in suppressing the others and establishing dominance over the whole country? It’s the money. Eliminate the Assad regime’s hard-currency income and it will fall. So do nothing to the Syrians, and blockade Iran instead. Use one of the OMG class of cruise-missile carrying submarines (Ohio, Michigan, Georgia) to flatten Iran’s oil-export and refining infrastructure, and deliver sea mines off Iran’s oil export ports. This will be a two-fer-the-price-of-one attack, which knocks out two of the Axis of Evil. Iran’s mullah regime depends entirely on sharing of hard currency from exports of oil, and the Assad regime’s existence depends on Iranian subsidies. This will even make Putin happy as the price of oil temporarily soars. Not sure that I agree but thank you for at least presenting a rational case for involvement with a specific goal, something O and his minions have either failed or just not bothered to do. This the most convincing case for intervention I have seen. Anywhere. Not surprising. Trent is smarter than most of the people out there writing. The Turks, Israel, Jordan and the Saudis all have different factions they will support with Assad gone. >>the heavy lifting for a problem in the EU’s back yard? Please note, a Syrian military intervention by the USA is not “for the world” or “for peace.” It is for American freedom at home by acting to keep the WMD genie in the bottle. As for the rest, neither the EU nor NATO are a states. Only states make decisions to fight wars. Only France, Turkey and Britian have the military forces to affect Syria at a fraction of the heft of a US intervention. Iran is a bigger threat to us than al-Qaeda. Al-qaeda in charge of Syria means we have targets for our air forces and no real air defense post-Assad. However, Tom Holsinger has a point about taking out Iran’s economy and getting Syria as a two-fer. Can we have that, pretty please? The Iranians have lost every open warfare fight with the USA it has tried. This will unite Israel to finish Hezbollah once and for all. Hezbollah without Syria is meat for the IDF. Before declaring the Chemical Weapons Convention dead, can I see a full list of all your past predictions regarding war, Islam, Islamic regimes, socialist regimes, and nuclear, chemical, and biological weapons, so as to ascertain the accuracy of your judgments in these matters? The Assad family has been massacring Syrian rebels since I was a teenager forty years ago. Chemical weapons were used in the Iran-Iraq war, Vietnam, Yemen, and a few other times and locations if I can believe the news. Why is this time different? Why will the world as we know end this time? So if Congress declares war on Syria, the IRS will be abolished, the regulatory state scaled back to 1930s (or better, 1920s) levels, the local police will be de-militarized, the NSA will retire all its employees, the 17th amendment to the Constitution will be repealed; “gun control” groups will admit they’re wrong and all 2nd amendment infringements will be repealed…, and the American people will be free? I don’t get the connection. No one is going to risk crashing the world economy nor putting a carrier at risk. Oh well if handing Iraq to Iran was not stupid enough for you go ahead and hand Syria to Al Quada. The stupid stakes are yours. It is true that removing Assad, along some genuine American/Western influence in the rebuilding, could have been a titanic victory for good. Imagine, right now, if we had 30,000 – 50,000 troops on the ground in Iraq. Battle hardened and tested combat troops. Gee, ya THINK that might help regarding the two primary countries on Iraq’s border? Now, ponder where we would be if the British had signed off on it. They could even quietly inform us not to expect much, but that they supported the effort. That’s all we really would need. And we got the exact opposite. Why.? Because this administration has gone out of it’s way to spit in Britain’s eye from day one. And I mean literally, day one. Obama was inaugurated at 12 noon, 1/20/08. At 4pm, he publicly removed the Churchill bust from the White House. Gee, ya THINK Britain had any trouble getting that message? Contempt for the royal family, support for Argentina over the “Maldives” (*Ahem*. Love that. Insufferable progressive wording and idiotic geography combined. MSM/SNL crickets followed, of course. ), all just part of a litany of insult to the British. His political effort here would be up ten points, minimum, had they had he not gone out of his way to tick off the British, and if they were to lend a hand here. How’d all that “smart diplomacy” work out for you, Mr. President? Then, there is such absurd blundering, which continues to this hour (Kerry: “An unbelievably small attack”. !!!!. Are you people kidding me?? ), which has left no one, including Assad’s ten year old kid, taking our President seriously. The kid doesn’t, that doesn’t really matter. The Chinese and the Russians, now pouring resources and assets into the area, most certainly don’t. Ge, ya think THEY matter? (Think they would have done that to one George W. Bush in 2003? Nope.) How’d that reset… (I mean um… ressett…. or maybe “banana patch”, was it?) work out for you, us, Mr. President. If world leadership was a prison yard, and it is, between Putin and Obama, just who is who’s bee-y##ch here, and the whole world knows it. I could go on, more’s the horror. But that’s the problem with Trent’s, not analysis, but his reality. If an attack IS the right thing to do…. we CAN’T do it. Our benighted clown-show leaders and our elites have so hopelessly screwed the pooch that we cannot make the upsides outweigh the downs. And some potential downs are too horrific to even contemplate. In WWII both the Soviet Union and Germany had chemical weapons, but they were not used. I don’t think that had anything to do with conventions. OTOH, chemical weapons were used in the 20’s and 30’s against less advanced peoples. Draw your own conclusions. You can’t have the US act as enforcer if the people aren’t willing to play that role, and doing so after the last 12 years of Kerry and his ilk playing the pacifist card ain’t going to happen. And of course, the idea of following these lunatic clowns into war is enough to encourage the most steadfast to go AWOL. You write this like it wouldn’t be much worse than the status quo. The biggest question I have is, who his he, who is this guy, what’s his motives, why is that still up in the air, even at this late hour? Obama has made drastic cuts in the number of boots the US can put on the ground anywhere overseas; he has cut back the navy so much that the nsvy can no longer project shear overwhelming force in seas 5,000 miles or more from US shores. We don’t have the military power – land, sea or air – that we had at Haiphong. Putin has vastly increased Russian naval power in the Med. Russia has always needed a warm water port and Syria can provide it. If Obama mines the Syrian coast line, Putin will claim the US has infringed on freedom of the seas and he may just sink the US fleet in the Med. Remember, Obama has sacked all the good commanders in the Med, Africa and Europe. Only brown noses remain. Should Obama adopt your plan global nuclear war will break out. So lets teach the kids duck and cover drills and where the shelters are (if there are any left). And stock up on bottled water, canned food and amunition. Ok, educate me if I’m missing something here, but I thought Syria was not a signatory to the Chemical Weapons Convention. How then could they have violated it? And what exactly would this geopolitical mechanism look like, whereby a non-violation leads to a generalized breakdown in the Convention? Or is there something in the Convention that obligates signatories to retaliate against chemical weapons use by non-signatories? Mark: You ask why, if countries containing 98% of the world’s pop sign a treaty, then are the 2% who did not sign obligated to obey the treaty? My Mother asked me: If all the kids jump off a bridge and drown, does that mean you have to jump and drown too? Obama says “yes, you gotta jump”.